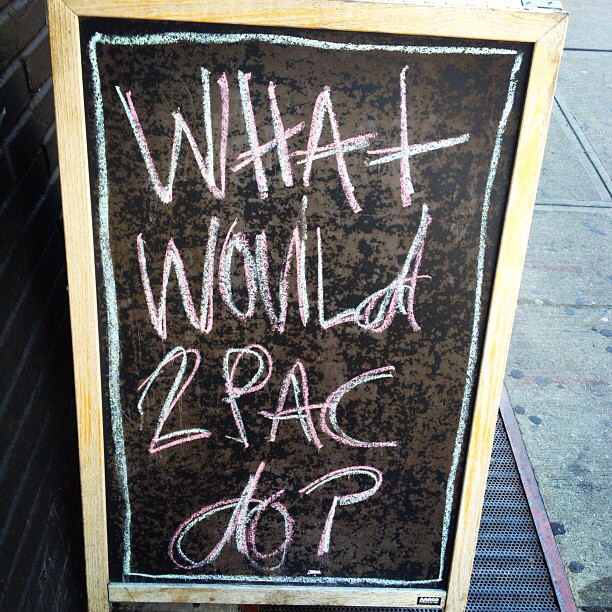 Ramblings from Jessie: What would Tupac do? Now if you have never heard of rapgenius.com before, you should definitely check it out. It has translations of basically every rap song thats popular, and the artists can login and say what the lyrics to the song actually meant. Seeing as 2PAC is deceased (saddness), and I don’t think the holographic 2PAC is going to be logging into rap genius anytime soon… I pondered the meaning of the lyrics myself. Presently, I have made some rather large changes in my life. I have decided to take a new job in New York. The hardest part of this decision was leaving behind my job now. Over the past year, my co-workers have gone from being friends to being my family. But the world of web is constantly changing and I am excited to get to learn new things and expand my experience. 2PAC’s interpretation of change (from what I gather) is that it should be sparked by something, but the truth is change can come about for a variety of reasons. I chose change to grow more knowledge in the field I care so dearly about, not to mention my love for the city of New York. So, yes the next time you are faced with a decision you can think ‘What would 2PAC do?’, but also trust yourself because when it comes down to it you are your own best advocate.